1.Now LED fixtures have no Starter and Ballast inside, our T8 LED tube is best to replace for LED fixtures. Can replace fluorescent tubes, both in FA8 series. 2.Our LED tube light can work with Electronic Ballast or without Ballast, but old style inductive-ballast not compatible. 3.Please Remove Starter/Bypass Ballast if this will be a replacement for traditional and old style fluorescent tube lighting fixtures. 4.There are two kinds of LED tube light 8FT, cover in frosted or in clear. Clear cover will make your room brighter, Frosted cover will soften the light but not too bright. Application: Work on all US home and office standard bi-pin lamp holder. Installed in schools, hospitals, parking lots, office buildings, and hotels. Work shop, workbench, bathroom, basement, shop, garage, kitchen etc. Tell us about your fluorescent lighting application and we will provide a best solution for you. Main product: LED Tubes, LED shop lights, LED recessed lighting, LED wall pack, LED flood lights, LED bulbs etc. ✔ Energy Saving - Energy Savings of up to 75% over our product's lifespan. Rated over 50,000 hours of use, that's about 23 years @ 6 hours/ day. ✔ Easy Installation - Our LED Tube Lights only work with Electronic Ballast, not traditional Inductive Ballast. ✔ Wide Application - Ideal to Installed in offices, schools, hospitals, hotels, workshops, etc. Also suitable for indoor garden lighting. 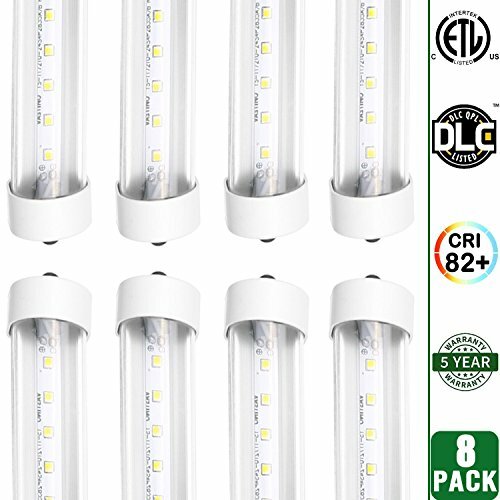 ✔ Rebate Eligible - Our LED Tube Lights are DLC-Qualified and thus eligible for State and Nationwide Rebate programs. ✔ 5 Year Warranty - Hykolity's 5-Year Warranty means we got you covered! Contact us if any issue arises. If you have any questions about this product by hykolity, contact us by completing and submitting the form below. If you are looking for a specif part number, please include it with your message.